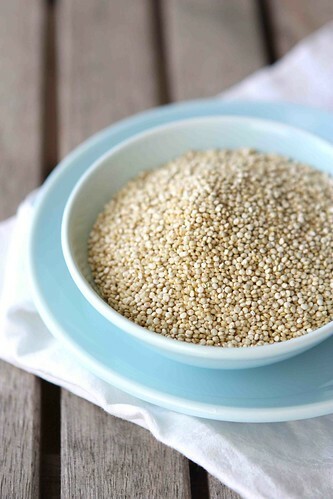 If you loaded the amount of quinoa our family eats in one year into a small boat, that vessel would sink to the bottom of the sea faster than you could say “healthy mini grain” five times fast. Quinoa (pronounced keen-wah) is actually healthy; I didn’t just make that up. It is a complete protein source, plus it packs a punch with its fiber and iron content. Not too shabby for a grain that only takes 20 minutes to cook and can be livened up with flavors such as lime and chipotle peppers or cumin and orange. With a mint plant that is trying its darnedest to bust out of its pot, we started to use the fragrant leaves in drinks, salads and desserts (think Watermelon Mojito Sorbet). 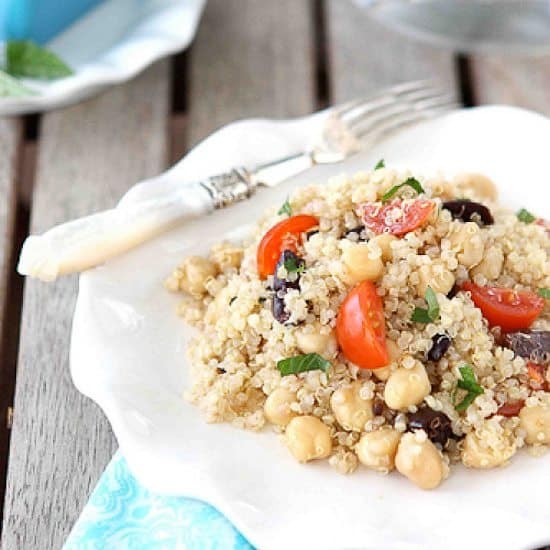 In this recipe, it is mixed with protein-rich chickpeas and briny kalamata olives to make a light salad that can be served either as a side dish or vegetarian entree. In a medium pot, combine quinoa and water. Bring to a boil, then cover and turn heat to low. Cook until all the water is absorbed, about 20 minutes. Remove from the heat, fluff the quinoa and transfer to a cookie sheet, spreading the quinoa in a thin layer, to cool. For the dressing, whisk together white wine vinegar, lemon juice, honey, salt, and pepper in a medium bowl. While whisking constantly, slow pour in olive oil until combined. From the kitchen of Cookin Canuck. This salad sounds so yummy! Great recipe. Mmmm. Hey! That recipe looks familiar, and I know personally that it’s delish too. Your photo looks divine, great light, composition and styling too. Your workshops have certainly paid off! Thanks so much, Heidi. Yes, you got to taste test this one personally. I made quinoa awhile ago and loved it. It had almost a nutty taste to it. Really enjoyed it. Thanks for sharing with us. You’re right, Kim – quinoa does indeed have a nutty taste, which adds a nice element to a lot of dishes. Great combination of ingredients! Thanks for sharing! Simple yet so flavorful and healthy. Love this recipe! Love everything in this quinoa! I’m right there with you on the massive quinoa consumption, it’s so good! Sylvie, I’m trying to remember what we used to eat before discovering quinoa. It is such a staple of our diets now. Love love love quinoa! This looks awesome. I can testify to how delicious this is, loved it! This is my favorite type of salad to eat, I could eat this everyday and be so happy! Really beautiful Dara!! I’m so happy to see a recipe for Quinoa! I’m using it a lot more these days. You can do so much with it! I just bought some quinoa to make a salad too! Great minds think alike! Haha! 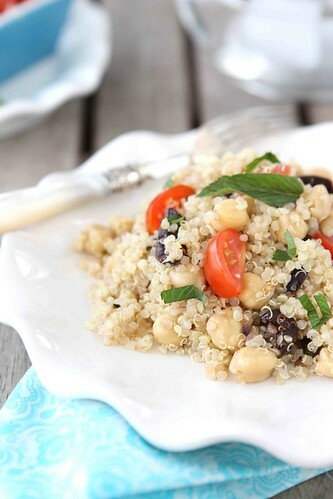 You can’t have enough quinoa salad recipes! It’s my go-to summer dinner dish. Looks like I’ve got another to try, thanks for sharing! Hehe…I JUST told someone I have to find more uses for quinoa since buying a bag of it at Costco. I’ll be making quinoa for years. Thank you for hearing my thoughts and providing this answer within moments Dara! Beautiful salad I just happen to have all the ingredients for. Yay! I always forget about making quinoa eventhough I know how healthy it is and how good it tastes. This looks like a very inviting recipe that I will have to try. Thanks for the reminder about quinoa. Great Pics. My family loves quinoa too. I use it as a substitute for rice and serve it with Indian curries. They are so flavorful that I no longer miss rice. I have never tried quinoa, but this sure makes me want to. Looks wonderful. This looks so amazing Dara! I love the addition of mint and honey – not something you see in every quinoa recipe 🙂 I will definitely be giving this a try. Your pictures are amazing…I’m just dying for a DSLR but even then it would take me years of practice (and probably not having 5 & 6 year old boys under foot) to come up such amazing shots. This is such a delcious healthy meal I just love chick peas! Simple – economical, delicious – nutritious – and absolutely stunning… this is my mantra and you are singing it proud! A beautiful summer dish! YUM! Awesome! I love that there is mint in this salad – I actually have some mint sitting around right now that it begging to be used in something delicious like this! Hey reader, I can tell you that this salad is delicious! I was lucky enough to try it!! Another great recipe and, girl, your photos are something else! Oooh, I love the mint in there! I just got a whole bunch of it from my CSA so I will have to make this!! 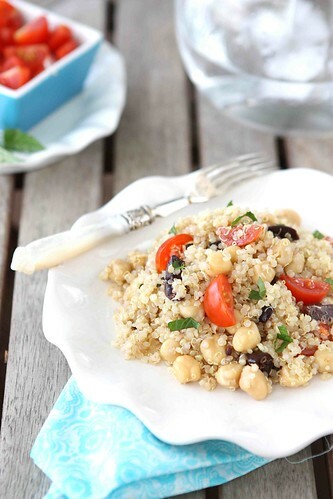 this looks great…i’ve tried quinoa but haven’t cooked it myself yet. Now I’m super inspired to make a serious quiona salad…thanks for the inspiration! Thanks, Charissa. Where in Canada are you from? I’m just getting into eating more quinoa and this dish sounds amazing! I love the inclusion of chickpeas and mint… delicious! I need to get on the quinoa bandwagon again. I fall off occasionally – my mom didn’t make it growing up so I often forget about it. I love it though! 🙂 Nice recipe! We are getting close to eating quinoa as much as you 🙂 There are so many ways to throw in these delicious nutty seeds. Love the pairing with the mint, perfect for summer. Dara, this is funny! I just posted a similar recipe on my not-so-foodie blog. Looks delicious, and contains some of my favorite ingredients! Yum. I’ve gotta make this salad — it looks so fresh and delicious! This is great Dara. We (I) love quinoa so much…have to start making more with it! This is a great salad, I like quinoa cold in a salad so much more than warm. This looks delicious! Looks delicious. 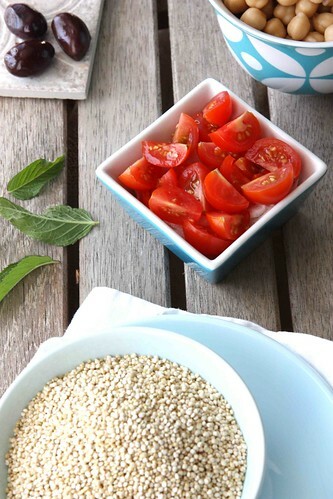 I love quinoa because it can really go together with anything I can pull out of the garden, it’s wonderfully versatile. I love Quinoa! I always mean to make it more often- this is a great recipe to get started! Such a great, healthy summer salad. Wonderful! What a nice light protein complete summer salad – love the mint too! made this tonight and it turned out great!! we have fresh tomatoes and mint from our garden that i was looking to use. i doubled the olives and i cooked the quinoa in the microwave(so i used 2 1/2 cups of water). delish!! thanks for the recipe. I’m so glad you enjoyed this. It sounds like you have the same penchant for olives as I do! SO good. I added corn cut off of one cob and garnished w/ avocado. Forgot to add the mint but MAN O MAN O, is this good! Possibly favorite summer quinoa salad so far. I doubled this recipe for a summer party – The only changes were that I added 2 whole cut-in-small-cubes fresh garden cucumbers, 1 cup very finely diced red onion, both 15 thinly cut leaves of fresh basil & fresh mint – there was no more salad left after about half an hour into the party – a definite keeper. Made this again tonight. Again w/ avocado. Lime juice instead of lemon. Oh, baby! This was soooo good!! I didn’t have cherry tomatoes so I didn’t add it and I only had red wine vinegar so I added one tbsp of that instead of two for fear of tasting bad.. and it is DELICIOUS! CAME OUT DELISH!! Oops! Clearly I meant to post this to ANOTHER recipe. Loved it! I added an array of veggies to it: zucchini, onions, broccoli. Just made this fir dinner and LOVED it! I didn’t have any tomatoes but used cucumber instead and it came out great. Thanks for sharing!